Leading Manufacturer of air operated oil barrel pump - 200 liter, oil pump ato 200 - pneumatic and oil pump - ato 200 - air operated from Coimbatore. 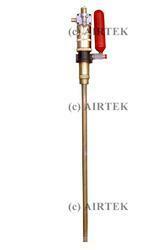 AIRTEK,renowned leader in lubrication pumps provides a complete range of performance proven Grease pumps. Our pumps are renowned for their versatility and ease of use.